Chronicles Dave's adventures living as an ex-pat in Mexico. Just another average sunset in paradise! I have received several inquiries asking for updates on my health and whereabouts. I know I should have continued posting but nothing of real relevance was happening and I wanted to make sure of what my future holds before sharing it. I spent September and October in Aticama but did not stay at the house on the hill. Thieves took everything from the house while I was in the states in July and August so I rented a motel room for my stay. While I was in the motel, thieves broke into Dod and took everything including all the copper piping. My health is excellent with two clear PET scans behind me, my doctors have changed my future tests to once every six months instead of quarterly. My current location is Seattle, WA. My friend Christen (you can read about our meeting and past travels by using the search box for "Christen") bought a 24' motor home and asked me to help her drive south for the winter. Seattle is beautiful but cold and rainy. We leave here tomorrow morning for another great adventure. I probably do need to change the title of my blog as I will not be "dodding" anywhere. The good news is that we will be on the road again looking for the best free camping spots and I will be able to get motivated to communicate via this blog. I have a new camera and computer so I hope to share some interesting stories and pictures with you all! 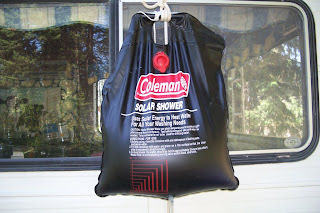 As you may recall, for the past couple of years I have used a solar shower. It worked okay but it took a couple of hours to warm up even in the heat of Aticama. It finally broke so I needed another way to heat water. We use a lot of black hose at the house and at the orchards. The fact that the water came out hot got me to thinking that if I used more hose I could get enough volume of hot water to bathe. Leaving the coiled hose on the patio table in direct sunlight provides almost 5 gallons of hot (probably 120 degrees) water in less than an hour. 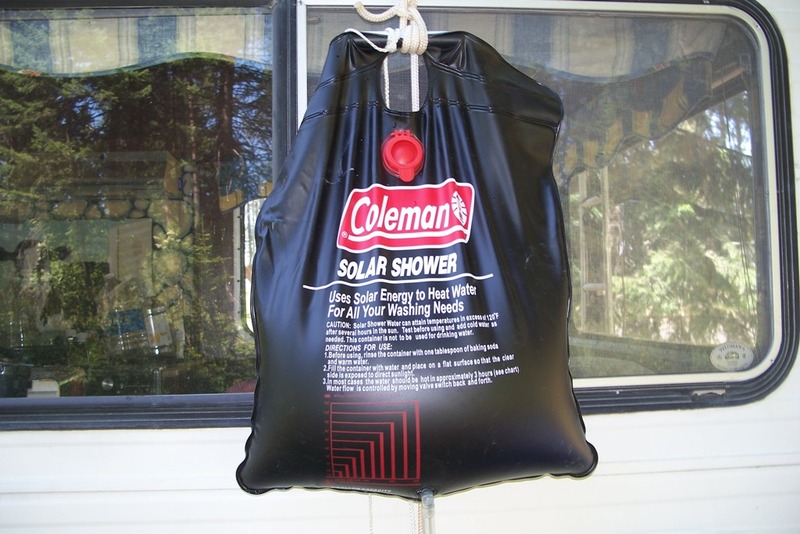 In addition to the patio bathing, the water is a great temperature for doing dishes and laundry! I apologize for not posting for the past couple of weeks but I have been awaiting news from the doctors and did not want to post until I had the results. Well, the results show that I am 100% cancer free and the doctors say there is no reason for me not to live to be 80 or more! I am at my brother's house in Bakersfield, CA now waiting for my new passport book to arrive before I return to Aticama. It has been over 100 degrees here for the past week and the forecast is for 100+ for the next week or so. It may be hot in Aticama but living right on the ocean keeps it feeling much cooler. I miss my dogs and my friends but am enjoying a wonderful visit with my brother Rick and his family. Rick had his second knee replacement on Tuesday and everything went well and he is recovering rapidly. Part of the reason I am here is to help him with his recuperation but he is doing so well, there is not much I can do but enjoy his company! "What does a man need - really need? I am a retired entrepreneur living in Mexico on a very small budget. I am watching a friend's house up on a hill overlooking the tiny village of Aticama, Nayarit, Mexico. My Mexican dog Sarah and I take small excursions from Aticama in my RV "Dod". Dod is a 1979 Dodge Tioga Arrow who just happened to be missing the "ge" from the Dodge nameplate. Dod is 18' in length and powered by a Dodge 360 with less than 75,000 miles. Accessories include: 3-way Dometic refrigerator; three burner propane stove and oven; heater; water heater; bathroom with shower; in other words, everything you would find on a much larger RV (except space). Dod's previous owner drove into a low hanging tree limb and crushed the right side of the cab over. The damage allowed me to almost steal the rig.